Saudi Foreign Minister Adel al-Jubeir attends a high-level meeting to discuss the current situation in Libya during the 72nd U.N. General Assembly at U.N. headquarters in New York, Sept. 20, 2017. The United Nations launched a road map on Wednesday for a renewed international effort to break a political stalemate in Libya and end the turmoil that followed the country's 2011 uprising. The world body's Libya envoy, Ghassan Salame, set out an "action plan" on the sidelines of the U.N. General Assembly in New York that proposes amending a 2015 peace deal that quickly stalled. The U.N.-backed Government of National Accord (GNA) established under the December 2015 deal never fully materialized in Tripoli, leaving Libya with three competing governments aligned with rival armed alliances. "I am also convinced that today there is an opportunity to end a protracted crisis that has caused immense suffering and contributed to the instability beyond Libya's borders. We must all seize this moment," U.N. Secretary-General Antonio Guterres said in an address to key stakeholders. Hamstrung by internal splits in its nine-member leadership, or Presidency Council, the GNA has been unable to tackle Libya's acute liquidity crisis, save collapsing public services or bring powerful militias to heel. Though oil production has partly recovered and local forces ousted Islamic State from its North African stronghold of Sirte last year, security vacuums in central and southern Libya persist and armed groups control the informal economy. Eastern-based commander Khalifa Haftar has gradually strengthened his position on the ground, with support from Egypt and the United Arab Emirates. Lauded by allies for his anti-Islamist stance, Haftar is accused by foes of seeking to reimpose military rule that they fought to overthrow when they toppled veteran ruler Moammar Gadhafi six years ago. GNA Prime Minister Fayez Seraj said he wanted Salame to send a clear message to message to those who could try to subvert the process and make it clear that the GNA was the only party that should be dealt with. 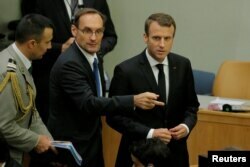 French President Emmanuel Macron, right, arrives for a high-level meeting to discuss the current situation in Libya during the 72nd U.N. General Assembly at U.N. headquarters in New York, Sept. 20, 2017. Salame, who took up his post in August, proposed reducing the unwieldy GNA Presidency Council to three members and having it then nominate a new transitional government. "The action plan was not designed by me, but by the Libyans. They want an inclusive process, a way forward which clearly defines stages and objectives," he said. Salame said the drafting of the plan would begin next week before the convening of a national conference for all key Libyan actors to join the political process. Securing changes to the 2015 deal would need the approval of a barely functional eastern-based parliament. The European Union and the United States have imposed sanctions on the head of that parliament, Agila Saleh, accusing him of stalling Libya's political process. A delegation from the eastern parliament is expected to start negotiating with members of its Tripoli-based rival assembly. They are under pressure to reach an agreement before December 17, when opponents of the 2015 deal say it expires. Salame, who appeared to suggest a new calendar of a year for the process, must also balance calls for new elections with the need to prepare a legal framework in which they can take place. Elections would require an electoral law, and possibly a referendum, to endorse a new constitution. In 2014, elections were challenged, leading to a major escalation of conflict and the division of Libya's key institutions. France, Britain and Italy, who have all at some point tried to assert their influence in recent weeks, said they were fully on board with Salame's plans. "We must be united behind the road map. Our collective credibility is at stake in Libya," British Prime Minister Theresa May said.